The importance of literacy is obvious. Everywhere you look, you see words – on signs, in training manuals, on buses, in books. Adults who can’t read risk becoming isolated from society. Illiteracy affects their ability to find jobs, and ultimately, their very survival. That’s why it’s so important to get kids reading when they’re young, long before they become adults. Even though their physical survival may not depend on knowing how to read a book, children do gain skills for coping with life when they learn to read. Early childhood literacy begins in preschool (if not sooner), when books and pictures are introduced to children with the intention of getting them familiar with letters, numbers, and symbols. Children who fall in love with the experience of reading when they’re young are likely to enjoy it when they’re older too. 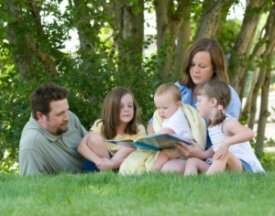 Early exposure to books, typically through being read to by a parent, grandparent, or other care-giver, instills in children a sense of security and warmth. The positive feelings these children get from books grows into a desire to read books for themselves when they’re older. Multiply this experience by hundreds of children and what do you get? An end to illiteracy! Of course, it’s not really that simple. Some children will need extra help due to learning differences or other types of challenges, but reading aloud to youngsters WILL help prepare them for learning other subjects as they grow. More proof of the importance of literacy. 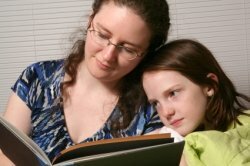 Literacy experts have discovered that continuing to read to children into their teens improves their vocabulary dramatically, and also helps strengthen emotional bonds between the child and his or her parent or teacher. These benefits alone will help improve the child’s life in a multitude of ways, some of which may not be apparent for decades. If you still need proof of the importance of literacy, browse through some of the other pages on this website. Better yet, talk to an adult who missed out on the privilege of learning to read when he or she was young, and find out how that's impacted their life. Literacy begins when a parent reads to his or her child at bedtime for the first time. It grows stronger as bedtime readings continue. And it grows even stronger when the child begins preschool and hears books read aloud by a teacher. However, there are many other ways in which to encourage a love of reading in children. Literacy strategies such as games, puzzles, songs, and videos or DVDs can also be used. Literacy games include old favorites like word searches and Hangman, and new ones like Typing Monster and Letter Blocks. Look for more at Primary Games and Apples 4 the Teacher. You can also find great literacy games in the educational sections of large toy stores, as well as stores that specialize in educational toys and other learning activities. See my page on Getting Kids to Read for even more ideas. The true success of any children’s book is in the story it tells. As mentioned on my page on Children’s Classic Literature, the best stories are those that speak to the human condition – deep stories that touch emotions which affect us strongly. When children are moved deeply by a story, and they carry that memory into adulthood, it can transform them into people who will always be able to rise above whatever difficulties they may face, no matter where they go in life.